By Rachel Meeropol, Senior Staff Attorney at the Center for Constitutional Rights. 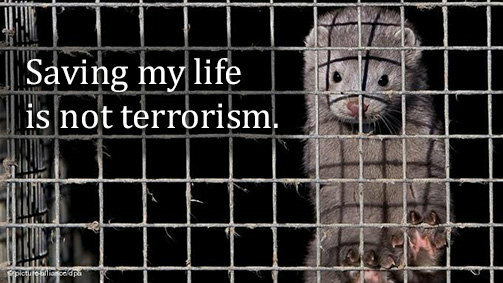 In a Chicago courtroom today, I will urge a federal judge to dismiss terrorism indictments against two animal rights activists accused of freeing thousands of mink from fur farms. Tyler Lang and Kevin Johnson are charged under the federal Animal Enterprise Terrorism Act (AETA). They face up to 10 years in prison. The Center for Constitutional Rights joined the defense team to continue our half-decade battle to have the AETA struck down as unconstitutional. The law punishes causing property loss (which includes lost profits) to a business that sells animals or animal products -- criminalizing not only loss caused by criminal acts but also loss caused by picketing and other constitutionally-protected activity. The AETA punishes a wide swath of expression by animal rights activists if it hurts the bottom lines of corporations -- a clear violation of the First Amendment. Lang and Johnson's case shows, however, that criminalizing speech is not the only, or even the most fundamental, problem with the AETA. Though the law prohibits all kinds of property damage, it has been used solely against animal rights activists, treating criminal acts committed in the service of their ideology as drastically worse than crimes committed for other reasons. Had Lang and Johnson been accused of stealing mink coats to sell for their own profit, does anyone believe they would be facing terrorism charges? This bias against the idea of animal rights turns an act of pure non-violence into "terrorism." Government lawyers insist there is no problem with calling such activity "terrorism" -- because they promise they "will not refer to the defendants as terrorists at trial or in any other context." Then why does the AETA punish freeing animals as "terrorism" at all? Indeed, regardless of whether prosecutors utter the term, if found guilty Johnson and Lang will be convicted "terrorists." The government says it is appropriate to criminalize such activity under a "terrorism" law because other acts committed against animal enterprises could properly be defined as terrorism, such as arson or bombings. This is like calling every assault "murder," because murder is a particularly brutal form of assault. Moreover, as lawmakers themselves noted when enacting the AETA, "It is a relatively simple matter to prosecute [arsons and bombings] using existing federal statutes." But, lawmakers continued, "it is often difficult... to address a campaign of low-level...criminal activity...in federal court." But why must low-level criminal activity by animal rights activists be prosecuted in federal court? Indeed, Johnson and Lang already pleaded guilty to state-level "possession of burglary tools" charges and served several months in state prison. The answer becomes clear when we consider that those who lobbied for the AETA are also those who stand to lose the most as the idea of animal rights gains acceptance -- organizations like the American Meat Institute, National Milk Producers Federation, and the Fur Commission USA. The profits of these industries depend not only on keeping animals inside cages but, more significantly, on keeping the idea of animal rights marginalized. Losing a few animals is pocket change; losing a public that pours billions of dollars into those pockets risks sending Big Ag and its compatriot "animal enterprises" the way of the tobacco industry. When it comes to protecting the profits of multi-billion dollar "animal enterprise" industries, the government wants to have it both ways. In the court of public opinion, it wants to be able to wield the AETA's terrorism rhetoric against unpopular activists -- but it wants to simultaneously avoid scrutiny in a court of law over calling nonviolent activism "terrorism." The courts should not allow it. Should non-violent animal rights activists really be charged as "terrorists"? The fur lobby says yes. Common sense and the Constitution say otherwise.